Doggie Daycare is a lot like a child daycare. 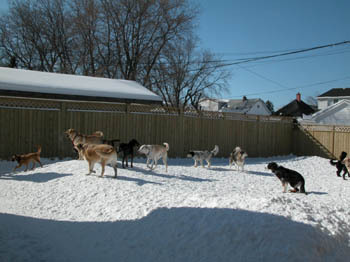 It is a place where dogs can play together, learn, socialize, have fun and burn off energy. It is a great place for dogs that have separation anxiety, bored and destructive at home, lack of stimulation and exercise. Precious Paws Doggie Daycare provides a convenient solution for dog owners who are otherwise busy and can't or don't want to leave their dog alone or need a tired dog at day's end when they return home. Precious Paws offers overnight doggy boarding service for a limited number of overnight guests. When you travel, your dog can skip kennel isolation and stress, or of being alone in your home awaiting a pet-sitter. At Precious Paws, dogs tire out after all-day group play and exercise.